To help dull the pain of another Halloween passing, Fangoria and Brainstorm Media are bringing "Silent Night, Deadly Night" back into theaters, making for a holly, jolly hackmas! 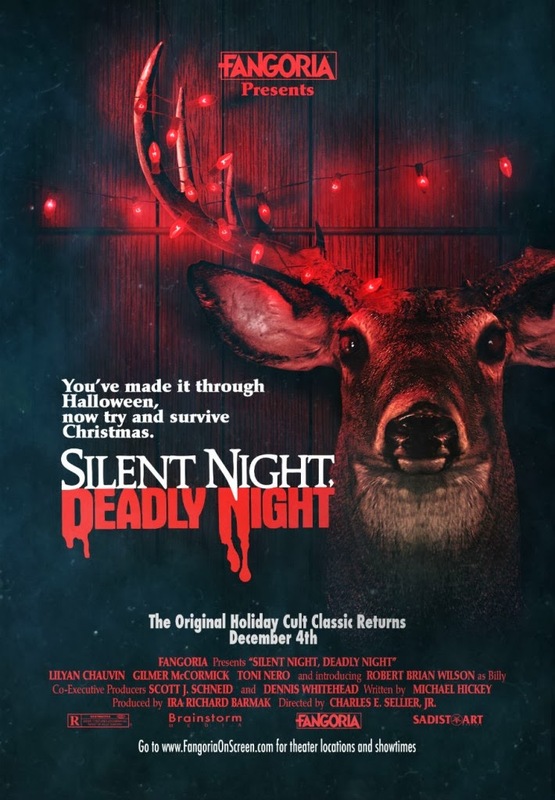 FANGORIA, together with Screenvision and Brainstorm Media, are thrilled to announce the re-release of the controversial, ultra-bloody anti-Holiday slasher favorite "Silent Night, Deadly Night," opening wide across the country in theaters everywhere! Released in 1984 to outrage and parental paranoia, director Charles Sellier’s killer Kris Kringle creeper tells the tale of a tot who, on Christmas Eve 1974, sees mommy kissing Santa’s axe as a lunatic invades their home and murders his family. Growing up in an abusive Catholic orphanage, the poor put-upon lad grows up to be a similar psycho in a Santa suit and goes on a bloody rampage. The film will be fully uncut and re-mastered, better to see every inch of those deer antlers penetrate poor Linnea Quigley’s breastplate. 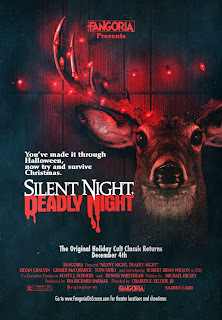 Silent Night, Deadly Night" will open on December 4th and show through December 17th. Head on over to FANGORIASCREEN.com for listings of specific theater locations and to purchase your tickets. Don't be naughty and miss out!